https://sep.yimg.com/ay/yhst-33477391359232/red-hawkfish-cyprinocirrhites-polyactus-lyretail-swallowtail-hawkfish-8.jpgRed Hawkfish - Cyprinocirrhites polyactus - Lyretail - Swallowtail Hawkfish EasySemi-aggressive20 Gallon5.5 inchesYes, with CautionCarnivore, Pellet, Flake, BrineIndo-PacificCirrhitidaeSmall 1" - 2"
Red Hawkfish also known as the Soaring or the Swallowtail Hawkfish is well known for its mottled orange to red body and a lyre-shaped tail. The species sports numerous short filaments at the tip of each dorsal spine and has a greatly elongated first dorsal ray in between the dorsal fin, long lower pectoral rays and a lunate caudal fin with filamentous upper an lower rays. 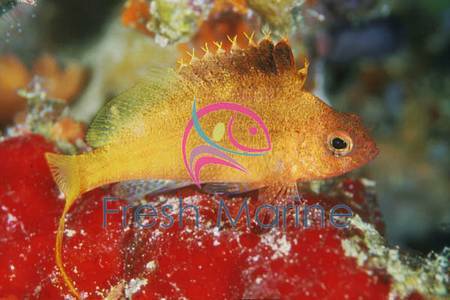 Varying from pink to brown in color, the Red Hawkfish differs from the other Australian species by its shorter snout and lunate caudal fin. Maximum Size: The Red Hawkfish grows up to a maximum of 6 inches. General Size: The smaller variety grows to around 1 to 2 inches, while the medium variety grows up to a size of 2 to 3 inches. Minimum Tank Size Suggested: For the Red Hawkfish, a tank of at least 30 gallons capacity is recommended. Tank Conditions: The Red Hawkfish can thrive in a fish-only, rocky environment with plenty of corals to serve as perches; however, space and fairly clean water is a necessity for this species� survival. Habitat: The Red Hawkfish is found extensively in tropical and warm temperate marine waters of the Indo-West side of the Pacific Ocean as well as in the western side of Australia from the Great Barrier Reef, Queensland to southern New South Wales. Feeding and Diet: Carnivorous and open to any meaty offerings, the Red Hawkfish easily adapts to a wide range of aquarium foods though smaller tank-mates also make for it a sumptuous diet. That includes other smaller fishes, crabs, shrimps and snails and this is where the wide mouth of this species comes handy. Planktonic crustaceans also make a much-preferred diet for the Red Hawkfish.